On October 11th, 2017, SedonaKind was privileged to be part of a Blue Star Memorial Dedication at the Sedona Public Library. The Blue Star became an icon in WWII and was seen on flags, and banners in homes, churches and businesses, in honor of sons and daughters away at war. The Blue star Program honors service men and women who have, are, or will be serving in the Armed Forces of the United States. 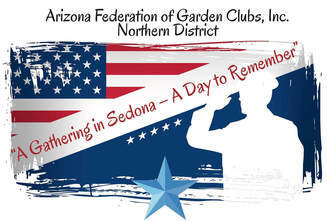 In 1945, the National Garden Clubs, Inc. adopted this program, and memorial markers and plaques are placed at national cemeteries, parks, Veteran facilities, gardens and libraries all over the country. ​A project that excites us all is our Kindness in Schools , or "KIS". When SedonaKind first began, we all knew that our biggest natural resource for spreading kindness is our children. And where better to take our mission of spreading that kindness than to the schools? 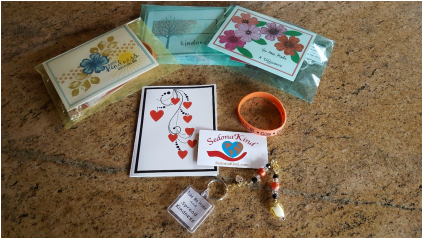 At SedonaKind, we're always talking about the power of the "pebble in the pond", and how one small act of kindness can sometimes travel the world, like our kindness charms. Last year we delighted in creating Operation Special Delivery, sending handcrafted cards to unsung heroes in our community. Learn about this year's project. Happy New Year everyone! No matter how crazy this new year might be, SedonaKind is kicked off 2017 with such a wonderful, and of course KIND project. It’s called Kind Art From the Heart, and we partnered with 4 other terrific NPO’s: Rotary, Sedona Art Center, Red Earth Theater, and Big Brothers/Big Sisters. On November 3rd, a group from SedonaKind took a field trip ( our very first!!) to visit Rainbow Acres in Camp Verde. Rainbow Acres is an amazing facility for people from 18 to 80 with developmental disabilities. The people they serve are known to all as Ranchers, which is so fitting as it is a beautiful ranch style campus. The mission statement is simple: Rainbow Acres is a Christian Community with heart empowering persons with developmental disabilities to live up to their fullest potential with dignity and purpose. SedonaKind members wanting to honor the Neighborhood Coordinators recently assembled 120 gift bags that they gave out on October 8th. What happens when you get a group of motivated knitters together for a good cause. 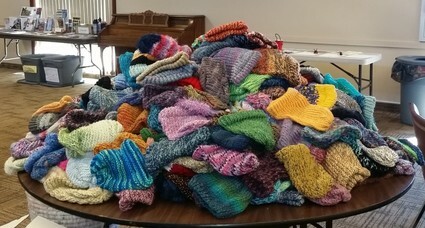 Well.......355+ beautiful knit hats that's what!!! The Sedona Veteran's Celebration the beginning of April was a huge success, and SedonaKind was so grateful to take an active roll. You can read about it and see some great pictures by looking in our Archives . Now that the event is over, you might be wondering what SedonaKind is up to next?